In this post we will look at the steps and stages of how to create a YouTube Video. This same process can also be applied to videos for Facebook, Instagram and other Social Media platforms. Knowing how to create YouTube videos, or videos fore any social media platfrom, is half the battle. The other half is knowing how to do this efficiently. Consequently, so many content creators bomb out on video production after just a few tries. They quickly label it too hard, or “not cost effective”. 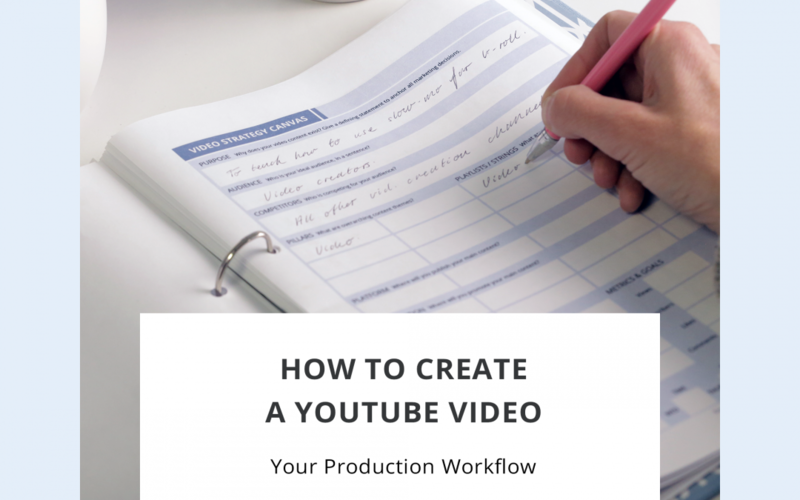 Creating successful videos for YouTube requires careful planning and an efficient video production workflow. If you are organised, know how to streamline processes, and you work in sprints, then video can be a highly efficient content medium. Let’s take a look at all the phases of video content creation that you may need to work through when creating a YouTube video. Some of these steps can be skipped, depending on the scale of your video production. We’ll also look at how you can plan and refine your video production workflow to ensure efficiency and success. I’ve listed the video content phases that I work through below (comment below if you think there are any I have missed!). I’ve grouped the steps into 4 phases. Each phase is considered a sprint. Make a list of the activities to be completed for the video, under each of the 4 stages – pre-production, production, post-production and promotion. When you are just starting out creating videos for YouTube, Facebook, Instagram, and other Social Media platforms, you will likely handle all of this yourself, but over time, as your business grows, you will likely outsource or hire people to handle various stages of the process. When creating videos for YouTube, Facebook and Instagram, you can use the following 4 sprint stages: pre-production, production, post production and promotion sprints. Each one involves from 6 to 12 steps, with each step, of course, requiring multiple activities and actions. How to create a YouTube video more efficiently is a question that is often asked. To increase efficiency, you may prefer to batch produce videos. So in week one you may focus on pre-production, week 2, production, week 3, post production, and week 4 getting everything ready for promotion. Then in week one of the following month you would start rolling out your videos and your video promotion, with ¼ of your video content being rolled out each week. At the same time, you would begin the production cycle again, working your way through content production for the following month over four weeks. First of all, you will work your way through pre-production, then production, and post-production. Finally, you will focus on promotion of your videos. Video production for Social Media platforms such as YouTube, Facebook and Instagram can be a long and arduous process. But if you are organised and systematic, you can create a video production machine that is efficient and produces incredible results for your business. One of the most confusing stages of video pre-production is deciding exactly what the goals are for your audience and your business, and knowing what content needs to go in your video to meet these goals. I’ve created a one page template that I use to plan each and every video I create, to help bring clarity on my video goals, audience knowledge and attitude toward the topic, and all the other essential juicy considerations you need to make when planning a video. Get your Free copy of the Video Brief now so that you can efficient plan your video content and avoid wasting precious time on creating videos that are never watched. Don’t want the template, but eager to get on my email list to receive updates, blog notifications, and free offers? I can understand that! Enter your email below to join me.